This optimizer searches for the optimal parameters. It changes its search radius and position using the grow factor ,shrink factor, and isotropic probability function (which is a random unit normal variate generator). This optimizer needs a cost function and a random unit normal variate generator. The cost function should return cost with new position in parameter space which will be generated by 1+1 evolutionary strategy. Users should plug-in the random unit normal variate generator using SetNormalVariateGenerator method. The SetEpsilon method is the minimum value for the frobenius_norm of the covariance matrix. If the fnorm is smaller than this value, the optimization process will stop even before it hits the maximum iteration. Another way to stop the optimization process is calling the StopOptimization method. At next iteration after calling it, the optimization process will stop. This optimizing scheme was initially developed and implemented by Martin Styner, Univ. of North Carolina at Chapel Hill, and his colleagues. Definition at line 69 of file itkOnePlusOneEvolutionaryOptimizerv4.h. Definition at line 77 of file itkOnePlusOneEvolutionaryOptimizerv4.h. Definition at line 87 of file itkOnePlusOneEvolutionaryOptimizerv4.h. Definition at line 86 of file itkOnePlusOneEvolutionaryOptimizerv4.h. Definition at line 93 of file itkOnePlusOneEvolutionaryOptimizerv4.h. Normal random variate generator type. Definition at line 90 of file itkOnePlusOneEvolutionaryOptimizerv4.h. Definition at line 96 of file itkOnePlusOneEvolutionaryOptimizerv4.h. Definition at line 76 of file itkOnePlusOneEvolutionaryOptimizerv4.h. Definition at line 99 of file itkOnePlusOneEvolutionaryOptimizerv4.h. Definition at line 74 of file itkOnePlusOneEvolutionaryOptimizerv4.h. Definition at line 75 of file itkOnePlusOneEvolutionaryOptimizerv4.h. Set/Get the minimal size of search radius (frobenius_norm of covariance matrix). Set/Get the search radius grow factor in parameter space. Reimplemented from itk::ObjectToObjectOptimizerBaseTemplate< TInternalComputationValueType >. Set/Get the search radius shrink factor. Initializes the optimizer. Before running this optimizer, this function should have been called. when users call StartOptimization, this value will be set false. By calling StopOptimization, this flag will be set true, and optimization will stop at the next iteration. Definition at line 156 of file itkOnePlusOneEvolutionaryOptimizerv4.h. Definition at line 181 of file itkOnePlusOneEvolutionaryOptimizerv4.h. Definition at line 201 of file itkOnePlusOneEvolutionaryOptimizerv4.h. The minimal size of search radius (frobenius_norm of covariance matrix). Definition at line 186 of file itkOnePlusOneEvolutionaryOptimizerv4.h. Definition at line 214 of file itkOnePlusOneEvolutionaryOptimizerv4.h. Search radius growth factor in parameter space. Definition at line 192 of file itkOnePlusOneEvolutionaryOptimizerv4.h. 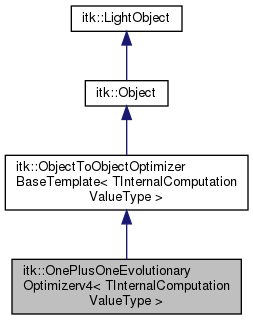 Flag tells if the optimizer was initialized using Initialize function. Definition at line 198 of file itkOnePlusOneEvolutionaryOptimizerv4.h. Initial search radius in parameter space. Definition at line 189 of file itkOnePlusOneEvolutionaryOptimizerv4.h. Definition at line 179 of file itkOnePlusOneEvolutionaryOptimizerv4.h. Definition at line 182 of file itkOnePlusOneEvolutionaryOptimizerv4.h. Smart pointer to the normal random variate generator. Definition at line 176 of file itkOnePlusOneEvolutionaryOptimizerv4.h. Definition at line 195 of file itkOnePlusOneEvolutionaryOptimizerv4.h. This is user-settable flag to stop optimization. when users call StartOptimization, this value will be set false. By calling StopOptimization, this flag will be set true, and optimization will stop at the next iteration. Definition at line 207 of file itkOnePlusOneEvolutionaryOptimizerv4.h. Definition at line 210 of file itkOnePlusOneEvolutionaryOptimizerv4.h.